Exposé Online » Reviews » Distillerie di Malto - Suono! It’s been at least a dozen years since the release of his band’s privately produced debut Il Manuale Dei Piccoli Discorsi, and it’s probably been close to that many years since I’ve heard it; what I recall most is that it wasn’t unlike a lot of other Italian progressive bands of the day, but showed a lot of promise and potential for future endeavors. 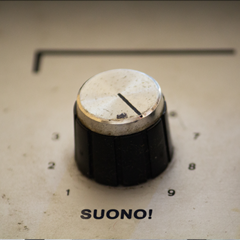 Suono! is only the band’s second album, but in the years between the band has grown and matured impressively, while retaining many reference points of full-bodied classic symphonic Italian rock, most prominently early Banco and PFM, but at the same time bringing in plenty of fresh ideas to grow the idiom. A workshop for group driven compositions and arrangements, with less emphasis on soloing and flashy playing, the eight tracks here range from lengthy epics to shorter more concise songs. While singer / guitarist Fabrizio Pellicciaro remains the band’s commanding focal point during the vocal sections, the remaining four members – essentially the same as the debut album with the exception of new drummer Alessio Palizzi, drive the lengthy instrumental sections impressively with strong group interplay. Pellicciaro sings exclusively in Italian, with some spoken sections as well, with the lengthier tracks “Lorca e Dali” and the two-part “Il Suono Seducente del Sogno” being the immediate standouts. Fans of the classic Italian symphonic sound should find plenty of interest herein.